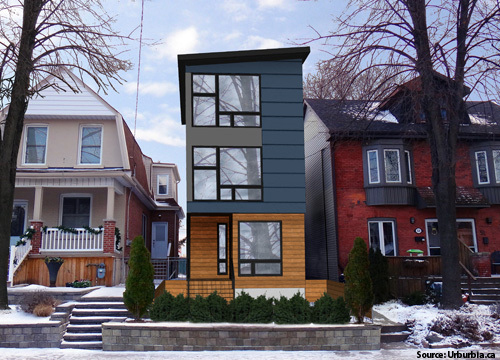 Welcome to the Durand Neighbourhood Character Project. The Durand Neighbourhood is one of the oldest residential areas in the City of Hamilton. Over its long history, the traditional streets and homes continue to define the feel of this unique urban area despite the loss of significant residential housing stock through previous periods of development. Hamilton is currently experiencing a renewed period of residential growth, and once again there is a challenge to balance new development with the existing character of the Durand neighbourhood. In response to this, the Durand Neighbourhood Association. launched the Durand Neighbourhood Character Project. The Project explores an innovative approach to defining and preserving neighbourhood character, inspired by an approach introduced in Ottawa. Neighbourhood character, in this context, refers to the look and feel of an area. It is made up of a number of factors that contribute to how private homes connect with the public street, or what makes up a streetscape. The Durand Neighbourhood Character Project focuses on how to maintain the feel of streetscapes. While there are various buildings of all shapes and sizes in any neighbourhood, the focus of this project is on low to mid-rise residential housing, which is six storeys or less in height. How Can We Maintain Character? There are existing rules and guidelines in place that City officials use to evaluate new home construction or additions to an existing house in established neighbourhoods. These are set out in neighbourhood plans and zoning by-laws. Different cities have tried to use different rules to maintain character in mature neighbourhoods. 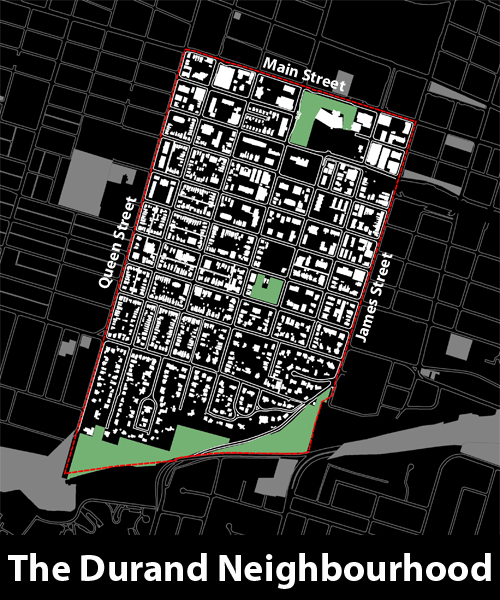 For example, urban design guidelines or heritage conservation districts are currently used in many Ontario cities, including Hamilton. The City of Ottawa uses an innovative approach to set these rules to help maintain neighbourhood character. The City of Ottawa uses an approach where "your street gives you your rules" for development in mature neighbourhoods. In this approach, property owners retain complete architectural freedom to design a new home or addition, as long as three key attributes that define the dominant character of a streetscape are maintained or strengthened. These three attributes related to: Front yards, parking, and the main door. To define what these attributes are, the City of Ottawa developed a user-friendly tool called a Streetscape Character Analysis. This allows the community to assess what is considered the dominant neighbourhood character on a streetscape, and the rules that new development needs to follow to strengthen that character. 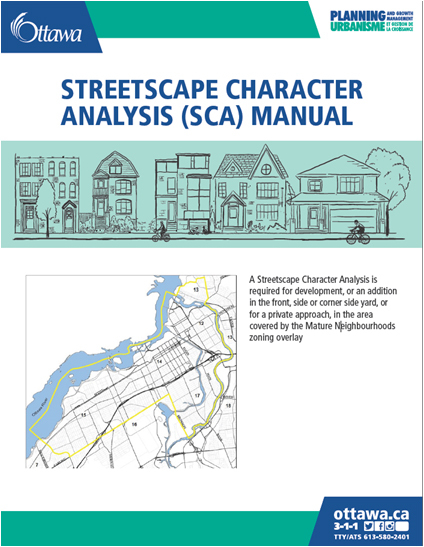 How does a Streetscape Character Analysis work? After a SCA is completed, it is submitted to City officials for their approval. At which stage it is used to evaluate whether a proposed development project is consistent with the dominant character of the street or not. How would a SCA work in Durand? 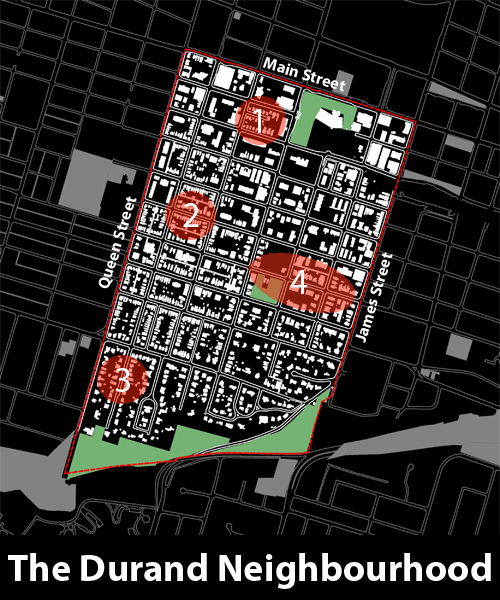 To better understand how character zoning would work in Durand, four Streetscape Character Analyses were conducted in different parts of the neighbourhood. The four zones that were assessed are highlighted in red on the map. To see the results of SCA 1, Click here. To see the results of SCA 2, Click here. To see the results of SCA 3, Click here. To see the results of SCA 4, Click here. As this project moves forward, we will be engaging citizens on how to better understand Durand's neighbourhoood character. For more information, go to the project website by clicking the link below. 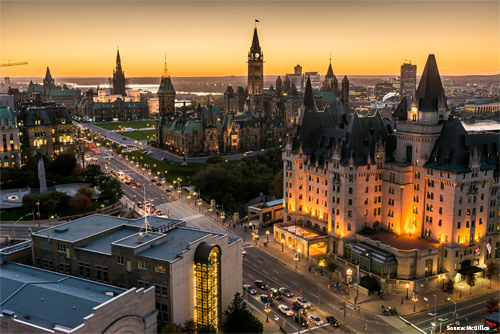 For more information on the Ottawa approach, click the links below. When does the Ottawa approach apply? 2016 Civicplan. All rights reserved.